According to The Blast, Slash has asked a judge to sign off on a settlement that would entitle his estranged wife Perla Ferrar to over $6.6 million as part of their pending divorce. In the proposed settlement, Slash agreed to pay Ferrar $100,000 per month in spousal support until she dies or remarries, with a $6,627,352 equalization payment, which is a payment made from one spouse to another for the purpose of offsetting an imbalance in joint property assets if one spouse receives more than the other. 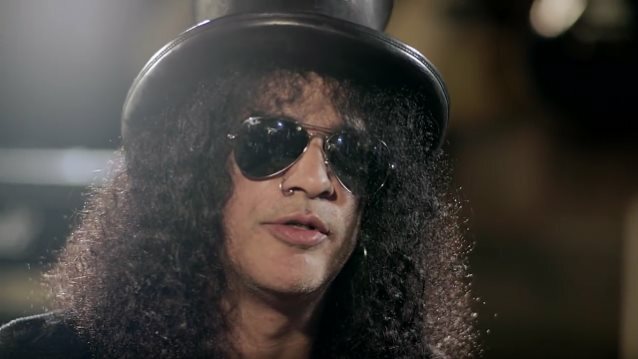 Slash will also get to keep his interest in all of his guitars, instruments, companies and residuals. The 52-year-old rocker offered to give the 43-year-old Ferrar primary custody of their sons — London, 15, and Cash, 13 — but asked to keep joint legal custody. He also agreed to pay $39,000 per month in child support, with his sons collecting 1.8 percent of his income until 2036. Ferrar will also get to keep a 2014 Range Rover, a 2015 Mercedes AMG and a 2015 Mercedes GL 450. "Perla has been slow responding, or has deliberately drawn out responding, throughout this matter," Slash, who listed his monthly income at $345,000, said in his court documents. "I want to move on with my life." The "Not In This Lifetime" trek, which reunited Slash, Axl Rose and Duff McKagan, launched in 2016, and is now making its way through Europe.